In this era of cybercrimes , malware and exploits, we still aim to make this world a ‘Happy place’ to live—especially for our kids. 21st century is the age of Internet, hence protecting our children from viewing any disturbing content becomes a crucial task. It is important for us to take care of what our kids watch on television, Laptop or Smartphone. YouTube made a decent effort in 2015 by releasing “YouTube kids” which features educational videos and kid friendly content. This brought in a huge sigh of relief for parents as they could restrict their kids from encountering any disturbing content on Internet. But unfortunately, even this filtered version of YouTube was not enough! Parents were terrified to see cartoon characters stripping in clubs or to see the sight of Spider Man urinating on a skyline, Peppa Pig drinking bleach and much more bad than you and I could possibly imagine. So, do you think it’s safe for our toddlers to view such inappropriate content? Don’t you think it’ll create a negative impact on your child’s brain? Yes, for sure! 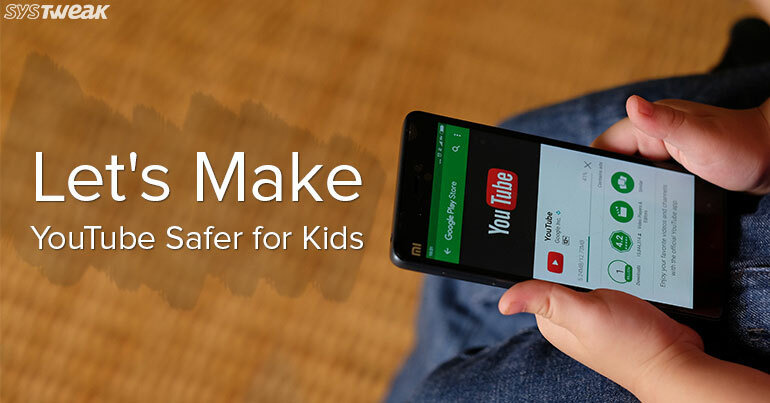 Keeping all this in mind here are few things you can do that’ll make YouTube kids a safer place for your kids. As YouTube is wide platform your kids may get to view a huge number of videos within their reach. YouTube kids allows to search for a particular video by just speaking or typing making it easier for kids to explore stuff. This may worsen the situations as YouTube might misinterpret what your kids just say and shares a list of disturbing content instead. To avoid this you can disable search function to restrict the limit of reach. For this, all you need to do is tap lock icon on the lower right corner, select Settings, tap on your kid’s profile and toggle the search option. And yes by strict we mean something smarter than “0000” and “1234”. Kids these days are much smarter than that! To set up a custom passcode for your kids profile head on to settings by entering a four-digit passcode spelled out on the Parents only screen. Now on the Parents only screen, you need to setup a custom passcode so that your kids won’t be able to tweak any settings. If your kids finds any video disturbing or offensive you can report it to the YouTube team. To block a specific video from streaming, tap on the three dots icon on the video, hit the “Block” option. Or if you want to flag a video for reporting it to the team tap on the three dots icon and tap file a report along with the issue stating whether the video had inappropriate audio or visuals. Don’t be disheartened! “YouTube kids” is not the only option available that streams kid specific content. You can always switch to other alternatives like Nick Jr, Noggin etc. A myriad of options are available out there! Must Read: 20 YouTube Features You Probably Don’t Use, But Should! So folks, we hope you’ll find this helpful as by following these tips you can reduce a lot of chances for your kids to stumble upon objectionable content.